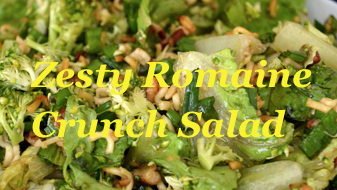 It’s been awhile since Passanante’s posted our Italian Summer Salad, so we figured it was time to post this fabulous recipe for Zesty Romaine Crunch Salad. This recipe is great when served with Heavenly Tilapia and a simple pasta — definitely worth wipping up this weekend. Let us know what you think about it on our Facebook page and be sure to post your favorite recipes too! Heat oil, cook nuts and noodles until crispy and light brown. Drain on paper towel. Mix all in plastic container and place in refrigerator. Chill dressing. Mix crunchy topping, salad and dressing just before serving. This entry was posted in Recipes, Sides & Salads and tagged Broccoli Salad, Heavenly Tilapia, Italian Summer Salad, Organic Produce, Organic Salad, Passanante's Home Food Service, Recipe, Recipes, Salad Recipe, Zesty Romaine Crunch Salad by Passanante's Home Food Service. Bookmark the permalink.